Please refer to our stock # 1-0662 when inquiring. 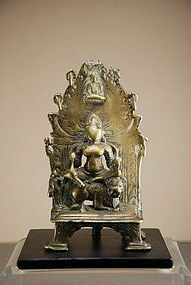 Small altar comprising of a statue of Green Tara sitting in regal repose on a lion, with a small statue of a worshipper on her lower right side, the whole group surmounting an elevated throne on four legs with, at the back, a large mandorla on the upper side of which stands a small Buddha in relief. Ancient inscription at the back of the mandorla (see photo). Bronze, with green and reddish patina in the recesses. India, 16th century or earlier. Height: 5 1/8" (13,4 cm). Due to the fact that one of the back legs is partly chipped, the altar is nicely mounted on a custom metal stand. Strong erosion, top of mandorla probably missing, otherwise good condition. Small Hindu Deity Stone Head, 16th C. Small Hindu Altar, India, 19th C. Small Jain Statue of Ambika, India, 16th C.